Monki Animal Builder is a fun and quirky app that children are going to love for the silly animals they get to create. 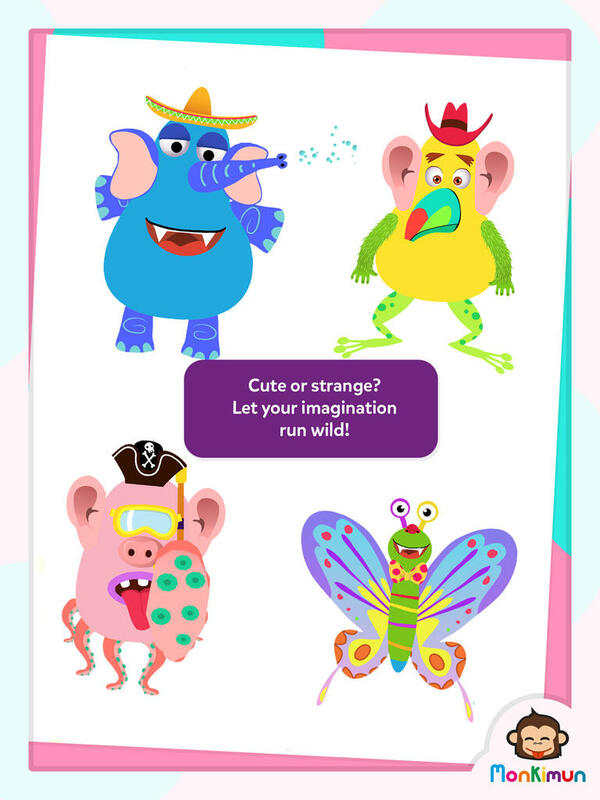 Monki Animal Builder is a creative app that is full of fun ways for children to create imaginative animals with a variety of looks. This quirky app has so much more than a variety of body parts as it also includes many accessories like hats, sunglasses, bow ties, and so much more. Children are going to love making their very own silly creations with this app as they have hours of creative play. One of the things I love most about this app is how animated it is. Everything from cracking the eggs in order to select a character to adding arms, legs, a mouth, a nose, etc. causes the characters to come to life. The quirky faces and sound effects that each creature makes creates a fun, interactive experience for children. The sound effects throughout are not only silly sounds, but also include words and phrases like “do I look pretty?” and “I can’t smile!”. These added phrases add a bit more life to the figures and create an overall fun experience for children. The user interface is also very simple to use so even young children can enjoy the app without trouble. With simple drag and drop technology to move the body parts and accessories into place there is no need for additional instructions or assistance needed. Monki Animal Builder is a wonderfully entertaining app. With so much to do it is seemingly impossible for children to get bored with this app. There are six characters to choose from in the form of a simple body that children can use as a blank slate to their creation. Each body has a different voice and personality as the other body parts are added. Along with arms, legs, eyes, a nose, ears, wings, etc. that can be used to build each animal, children can also color the main body as they see fit. Add in some very fun accessories like hats, goggles, an eye patch and so much more you have a highly entertaining app for kids! In addition to creating these fun creatures, children can save them in a gallery and view others from around the world and share their creations using a protected feature that parents must unlock to be accessible. Overall this app is all about fun and users are going to be able to use their creativity in so many ways to build fun, silly, and quirky animal creations. Priced at just under three dollars this app is a good deal. Children have a ton of options as far as body parts, colors, and accessories and the animation the developers have included really sends this app over the top. With so many versatile options for creating fun animals, this app will keep children busy for hours for not a lot of money. Monki Animal Builder is not only fun and creative, but it is also easy to use for children of all ages. With simple drag and drop technology children will have no trouble at all using this app. The developers have also made sure to make this app totally safe with no in app purchase links or social media links. The links that allow children to view and share animal creations with other children is protected which is great. A few things parents will want to be aware of are the small advertisement on the main page for another app by the same developer and the ‘rate this app’ button that pops up on the main page after the app has been opened a few times. The advertisement is protected, however the ‘rate this app’ button will take users to the App Store which isn’t ideal.